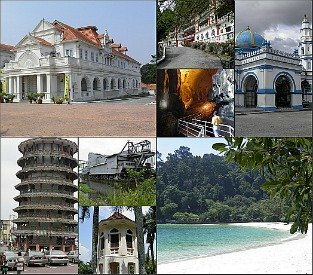 Top Perak Attractions - Here are my recommendations. 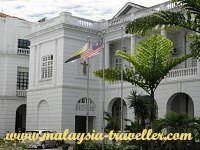 The historic towns of Ipoh (Perak's capital), Taiping and Batu Gajah contain some fine heritage buildings and places of interest while the Royal town of Kuala Kangsar has some interesting palaces, museums and mosques to admire. Perak was one of Malaysia's main tin mining areas and the country's only surviving tin dredge is a piece of industrial heritage that can still be visited. Add in the Leaning Tower of Teluk Intan, the former colonial hill station of Maxwell Hill, Kellie's Castle and for families, The Lost World of Tambun, and you can see that Perak has much to offer. Here are my suggestions for the Top Attractions based on those that I have visited so far. I may add more to the list as I explore further. 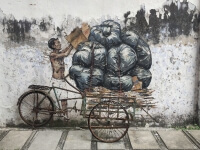 Take yourself on my Ipoh Heritage Walk, a walking tour of old Ipoh. I have prepared a map and information on over 30 historic buildings and points of interest for you to explore. Batu Gajah is not nearly as famous as Ipoh but it also has a lot to offer lovers of heritage with many fine and interesting buildings surviving from the colonial era. With this map and information you can do a self-guided tour. 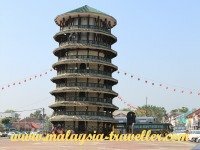 The small Perak town of Teluk Intan contains Malaysia's answer to the Leaning Tower of Pisa. It is an old water tower disguised to look like a Chinese pagoda and it has a distinct incline due to subsidence. Also try this Walking Tour of Teluk Intan to see more attractions. This riverside compound has some attractive buildings and a museum commemorating the assassination of JWW Birch, the first British Resident of Perak. 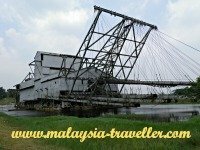 Close to the town of Batu Gajah in Perak there is a surviving tin dredge, a colossal industrial relic from the days when Malaysia was the world’s largest tin producer. Read about it here. 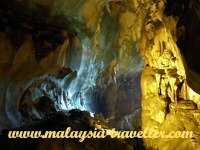 Tempurong Cave is one of the largest natural limestone caves in Malaysia stretching over 1.5km. It is a show cave with safe walkways and illuminated to reveal its natural beauty. It is easy to get to. 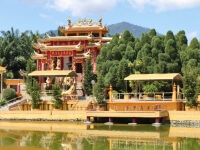 On the outskirts of Ipoh there are many fascinating cave temples to visit. 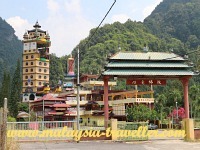 One of the most famous is Perak Tong Cave Temple. The cave contains a 40 foot high golden Buddha and beautiful murals. Climb 450 steps for a great view of Ipoh. This is an international standard theme park in a beautiful setting near Ipoh. In addition to slides, pools and other water-based attractions, the park has a mini zoo and hot springs. This historic half-built palatial home for a Scottish planter is one of the top Perak attractions. You can find out about its sad history and the legends that go with it. This island has some of the best beaches on the west coast of Peninsular Malaysia and busy fishing villages where you can stock up on ikan bilis and other seafood products. Banding Island is an ideal base for exploring Lake Temenggor and the Royal Belum Rainforest. Definitely one of Malaysia's most beautiful areas. 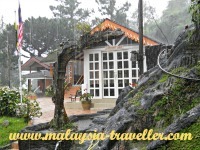 Little has changed at Bukit Larut Resort Hill in the past 100 years. It is still a place for nature, peace and quiet and fresh mountain air. 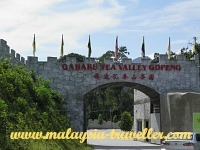 Gaharu Tea Valley is an agarwood plantation just outside Gopeng, Perak. You can tour the estate and sample their health-giving products. Visit Lenggong Valley Archaeological Gallery to see the oldest skeleton found in Peninsular Malaysia and gain an appreciation of the archaeological history of the Lenggong Valley, one of Malaysia's four UNESCO World Heritage Sites. Take a self-guided tour around Kuala Kangsar, one of Malaysia's loveliest and most historic towns. I have identified 35 places of interest and plotted them on a map so you can explore at your leisure. Taiping is Perak's most historic town. This walking tour of old Taiping covers more than 50 heritage buildings and points of interest. Definitely one of the top Perak attractions. Enlightened Heart Buddhist Temple is a sprawling Tibetan temple complex with a tall pagoda tucked away in a hidden valley near Ipoh. Unusual and interesting, this is one of the top Perak attractions and well worth a visit. 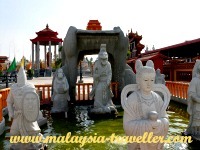 Tua Pek Kong Temple is an interesting Chinese temple located on the coast close to Sitiawan. At the River Terrapin Conservation Centre you can view the hatchery ponds and learn about river terrapins in the interpretation centre. 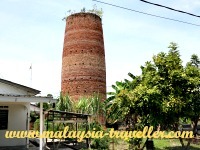 A rather quirky choice for a Top Perak Attraction but this chimney at Malim Nawar is all that remains of a World War Two carbide factory. 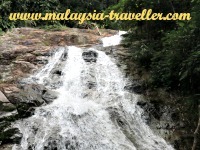 Lata Iskandar is a spectacular and easy to access waterfall which you cannot miss if you are driving to Cameron Highlands via the old Tapah road. 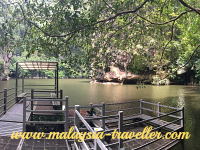 Tasik Cermin (Mirror Lake) is a stunning hidden lake surrounded by limestone karst towers. You need to walk through a quarry and a tunnel to reach it. 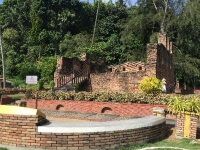 Dutch Fort Pangkor Island is the remains of an old warehouse built by the Dutch in 1670 to store tin ore. It has been partially restored as a tourist attraction. 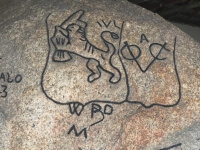 Historians widely believe that Batu Bersurat Pangkor Island is a rock inscribed with a tiger mauling a boy. They are all wrong. Find out what it actually portrays. Use this map and have fun finding the locations of some of Ipoh's famous street art. Seen Hock Yeen Temple is a popular temple for devotees of Confucius hoping for good health, a good marriage partner, to pray for children's scholastic success or to dispel problems. 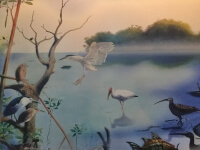 Kuala Gula Wildlife Conservation Centre has an interpretive centre where you can learn about seabirds found in this stretch of mangrove coastline. 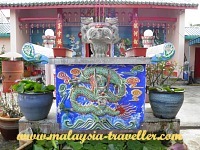 For more Ipoh attractions, take a look at my Thrifty Traveller blog. 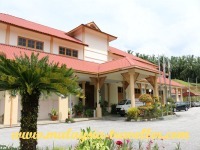 Need somewhere to stay in Perak? 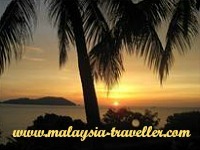 Take a look at Agoda's website for a huge selection of Perak hotels to suit all budgets at discounted rates. 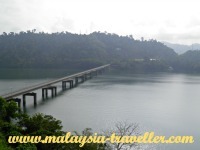 Hope you enjoy discovering these Top Perak Attractions as much as I did.